The future is uncertain for the regulation of greenhouse gases from power plants, including the U.S. Environmental Protection Agency’s (EPA) Clean Power Plan, which covers existing plants. The rule is under review in the D.C. Circuit Court of Appeals. If the rule is overturned or is severely weakened, whether through litigation or executive action, stakeholders are likely to litigate to seek to force the EPA to use other authorities under the Clean Air Act to regulate greenhouse gas emissions. 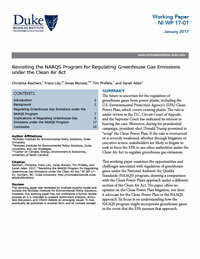 This working paper examines the opportunities and challenges associated with regulation of greenhouse gases under the National Ambient Air Quality Standards (NAAQS) program, drawing a comparison with the Clean Power Plan’s approach under a different section of the Clean Air Act. As states and stakeholders evaluate compliance options under the U.S. Environmental Protection Agency’s proposed Clean Power Plan, many recognize the potential economic benefits of market-based strategies. In some states, however, market approaches trigger administrative and political hurdles. A new policy brief by the Nicholas Institute for Environmental Policy Solutions offers a compliance pathway that allows states to realize the advantages of multistate and market-based solutions without mandating either strategy. With the common elements approach, states develop individual-state plans to achieve their unique emissions targets and give power plant owners the option to participate in cross-state emissions markets. 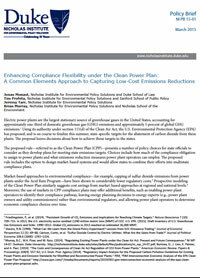 Power plant owners can transfer low-cost emissions reductions between states whose compliance plans share common elements--credits defined the same way and mechanisms to protect against double counting. The common elements approach offers the following benefits: (1) allows cross-state credit transfers without states negotiating a formal regional trading scheme, (2) leaves compliance choices to power companies, (3) builds on existing state and federal trading programs, and (4) maintains the traditional roles of state energy and environmental regulators. Much of the focus of efforts to reduce greenhouse gas emissions has been on the pursuit of policy mechanisms that will put a price on carbon. In the United States, such mechanisms have been established in several states and were the central feature of federal legislative proposals of the last decade. With the political failure of those proposals in 2009-2010, creation of a de novo carbon-pricing regime was given little attention—until recently. Calls for fiscal reform and an evolving regulatory setting (especially use of the Clean Air Act to regulate greenhouse gases) might create political appetite for a new effort to pursue a carbon-pricing policy. 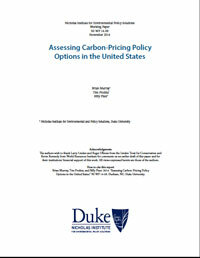 To inform discussion, this paper identifies and assesses options for establishing a price on carbon in the United States. Regulating Greenhouse Gases Sector by Sector under the Clean Air Act: How Well Does the Electric-Generating Unit Experience Translate to Petroleum Refineries? The Environmental Protection Agency is developing performance standards to limit CO2 emissions from the electric power sector, and refineries may one day face similar regulations. If so, some of the policies for regulating carbon emissions from electric-generating units might be translatable to a greenhouse gas (GHG) performance standard for refineries. However, differences between the electric power and petroleum refining industries may be substantial enough to warrant a re-examination of key regulatory decisions in the power plant rule. This policy brief identifies the key differences and highlights their possible significance for a GHG rulemaking for petroleum refineries under the Clean Air Act. 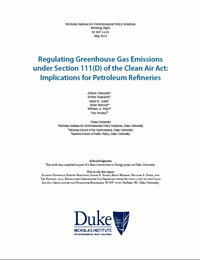 A companion working paper—Regulating Greenhouse Gas Emissions under Section 111(D) of the Clean Air Act: Implications for Petroleum Refineries—discusses the three major steps for rulemaking, policy design questions, potential responses, and their implications as well as examines options for tailoring discussions from power plant regulation, maximizing cost effectiveness, taking into account differences among refineries, and formatting regulation in a way that may best fit them. The Environmental Protection Agency is developing performance standards to limit CO2 emissions from the electric power sector, and refineries may one day face similar regulations. This paper describes the structure of the refining industry as well as the Environmental Protection Agency’s proposed authority to regulate the industry’s emissions under section 111(d) of the Clean Air Act. It discusses the three major steps for rulemaking, policy design questions that arise at each step, potential responses, and implications for environmental outcomes, equity, and cost effectiveness. 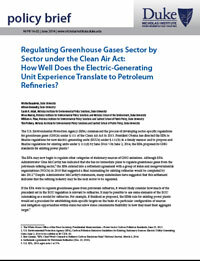 The paper concludes by highlighting key considerations for refineries, including options for tailoring discussions from power plant regulation, maximizing cost effectiveness, taking into account differences among refineries, and—given the industry’s characteristics—formatting regulation in a way that may best fit them. 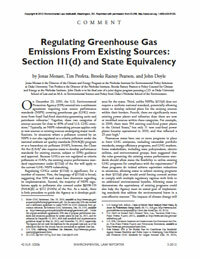 A companion policy brief—Regulating Greenhouse Gases Sector by Sector under the Clean Air Act: How Well Does the Electric-Generating Unit Experience Translate to Petroleum Refineries?—highlights differences between the electric power industry and the petroleum refinery industry and highlights their significance for rulemaking for the latter. The U.S. Environmental Protection Agency (EPA) proposed in 2012 proposed performance standards for carbon dioxide (CO2) emissions from new fossil fuel–fired power plants. Once finalized, the new-source standards will trigger section 111(d) of the Clean Air Act, which required the EPA to regulate CO2 emissions from existing power plants. Broad statutory language and limited legal precedent suggest that a variety of policy design options are available to the EPA and states when regulating CO2 emissions from existing power plants. At the same time, section 111(d) raises unanswered questions. In October 2012, the Nicholas Institute for Environmental Policy Solutions convened a stakeholder workshop in Washington, D.C., to discuss these questions. This report preserves the workshop discussion by summarizing panel presentations, highlighting points of conversation, and capturing key themes. This report also identifies tradeoffs facing regulators who will draft the existing-source regulations and notes issues ripe for further exploration. 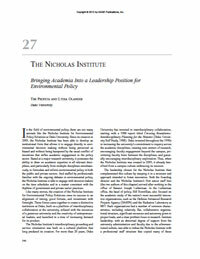 Researchers at the Nicholas Institute for Environmental Policy Solutions contributed to a chapter in the publication "Environmental Leadership: A Reference Handbook." The book covers topics that confront the particular intractable characteristics of environmental problem solving. Individual chapters focus on how environmental leadership actions or initiatives may be applied to address specific problems in context, offering both analyses and recommendations. On December 9, 2011, the Nicholas Institute for Environmental Policy Solutions convened a broad range of stakeholders to explore the legal and policy issues presented by the regulation of greenhouse gas (GHG) emissions under 111(d) (existing source performance standards) of the Clean Air Act. The workshop focused primarily on the options for states to demonstrate that existing GHG policies are equivalent to the 111(d) requirements. The Nicholas Institute distributed this document to workshop participants prior to the event to provide a framework for the issues that would be discussed. Nothing in this document should be interpreted as expressing the Institute’s opinion of the path the EPA should take on any given issue. 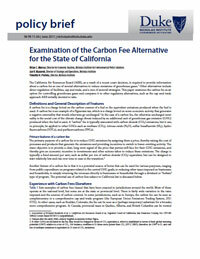 The California Air Resources Board (ARB), as a result of a recent court decision, is required to provide information about a carbon fee as one of several alternatives to reduce emissions of greenhouse gases. 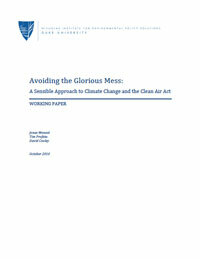 Other alternatives include direct regulation of facilities, cap and trade, and a mix of sectoral strategies. 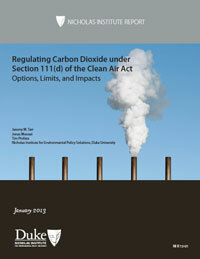 This paper examines the carbon fee as an option for controlling greenhouse gases and compares it to other regulatory alternatives, such as the cap-and-trade approach ARB initially decided to take. In March 2010, the Nicholas Institute for Environmental Policy Solutions at Duke University, the Duke University School of Law, and the Center for Law, the Environment, Adaptation, and Resources (CLEAR) at the University of North Carolina School of Law convened many of the nation’s legal experts on the Clean Air Act for an event in Durham, North Carolina, to examine the options for regulating GHGs under the Act. This report builds upon some of the ideas discussed at that meeting and described in recent publications, with the goal of identifying a viable approach to GHG regulation through the current Clean Air Act in the event that Congress does not act on comprehensive climate legislation.